'Waiting On' Wednesday is a meme borrowed from Jill at Breaking the Spine. All I can say is: SPEECHLESS. Sumary from Goodreads: Matthew has loved Ariel from the moment he found her in the tunnels, her bee's wings falling away. They live in Safe, an underground refuge for those fleeing the city Above--like Whisper, who speaks to ghosts, and Jack Flash, who can shoot lightning from his fingers. But one terrifying night, an old enemy invades Safe with an army of shadows, and only Matthew, Ariel, and a few friends escape Above. As Matthew unravels the mystery of Safe's history and the shadows' attack, he realizes he must find a way to remake his home--not just for himself, but for Ariel, who needs him more than ever before. 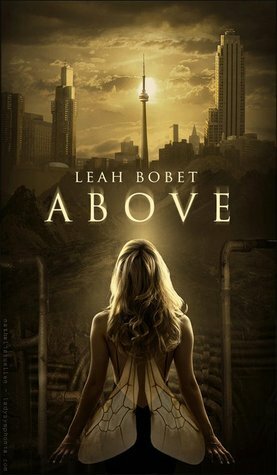 'Above' is gorgeously imagined -- the story of an underground community where a man with electricity in his fingertips or a girl who can shapeshift into a bee, can hide away, and what happens when those people are forced into the world, our world, Above. It has real things to say about insiders vs. outsiders, safety vs. risk, and how much we can be responsible for one another. And the romance between Matthew and Airel looks set to be gentle, slow, and beautiful - just the kind of break you might need from the undoubtedly amazing but slightly fast-paced romances that grace many YA novels right - while being surrounded by the gut-wrenching exit from Safe and the terror and adrenaline that comes with it for these misfits, these freaks that have been exiled from the only place they knew that held refuge for them. I for one will be adding this to my TBR pile at the first opportunity!